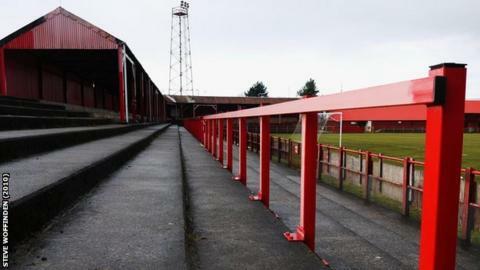 Workington general manager Alec Graham has said a five-figure sponsorship deal with a Hong Kong-based business will protect the club's short-term future. "We've got this very good sponsorship deal but we still need investment," Graham told BBC Radio Cumbria. "We'll continue working all along to ensure that this happens." Chairman Humphrey Dobie and fellow board members Colin Doorbar and Thex Johnstone confirmed they would be stepping down earlier this month. Meanwhile Graham has revealed the club are making progress with acquiring finance and new board members. "We were talking to another party but that was always going to be a difficult one to pull off," he added. "I'm still pretty optimistic that the club will continue and move on. "Those discussions [with two unnamed potential directors] are ongoing, we have been approached by a couple of people who said they would be interested in joining the board. "Whether the club calls an EGM or not I don't know, I'm not sure of the legalities. "Maybe we call a meeting of shareholders, but I'm sure there will be a meeting of some kind to discuss this."